One disorder affects another, so for the most effective treatments, both disorders should be treated at the same time. However, previously, addiction treatment professionals may have not had the resources or knowledge to treat both disorders. Now, the most advanced treatment centers integrate treatment for co-occurring disorders. When people are treated for co-occurring disorders, the relapse rates are lower. 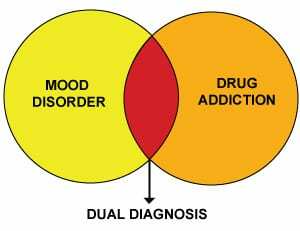 This is why treatment centers have integrated programs for co-occurring disorders. Then the patients can feel like their problems are truly being treated, instead of just scratching the surface. Addiction may have been the byproduct over an individual’s inability to deal with a mental health problem, and addressing that issue in correlation with addiction will address the deeper needs of the patient. Someone struggling with addiction may never have been treated for the other issue. When someone is struggling with co-occurring disorders it’s essential that both issues are treated with professional care. With such high-stakes, the patient can truly receive the specialized treatment and care for each disorder that will help one cope with both issues during the recovery process. Patients will learn the tools and coping methods, so that they can learn healthier ways to deal with both problems. Moreover, patients may have felt previously ostracized or wary about getting treatment, because they think that no treatment center would be willing or able to address both issues. But in a supportive and respectful environment the patient can finally be honest about struggling with co-occurring disorders. Another way treatment helps with co-occurring disorders are peer support groups. The patient will receive treatment in a group setting amongst supportive and respectful peers who also suffer from similar problems. By not feeling completely isolated anymore, the patient can start embracing the process of recovery. Most of the time, the addict’s loved ones will not understand what co-occurring disorders are, and how if affects the patient. Sometimes, addiction is viewed as just a matter of willpower or bad influences, but it’s more complex, and can be entwined with mental health problems. When the loved ones are educated more about this by addiction professionals, they can understand better the process of recovery for the patient. Without the treatment, the loved ones may never properly understand what the patient is going through. For long-term recovery, it’s very important that people close to the patient can form healthy relationships with the patient. Patients who suffer from co-occurring disorders can also benefit greatly from holistic treatments. Holistic treatment refers to treating the whole person, and not just the disorder. If someone has extreme problems with anxiety or stress, holistic treatments like meditation or acupuncture may serve as a form of release. The patient can learn to access different alternative treatments to access ways to cope with problems. This can provide a long-term tool that someone with co-occurring disorders can benefit from. People who suffer from co-occurring disorders are more likely to be homeless and have increased instances of hospitalization. Treatment helps reduce relapse rate, thereby increasing the patient’s chances of long-term and meaningful recovery. Addicts who suffer from co-occurring disorders may have previously felt they had no access to treatment, but now they can seek specialized professional help for their issues.